Chicken Schnitzel takento the next level - with a spinach and cream cheese stuffing! Your guests will have a tough time resisting the succulent, golden-crispy finish. Recipe available for download here! In a bowl; combine the spinach, cream cheese, pepper, chilli, Knorr Aromat Seasoning Powder, Hellmann’s Real Mayonnaise, and garlic; stir to combine well; leave it on a side. Cut a slit into the center of each chicken breast to make a pocket; combine with oil, cumin and Knorr Chicken Seasoning Powder well. 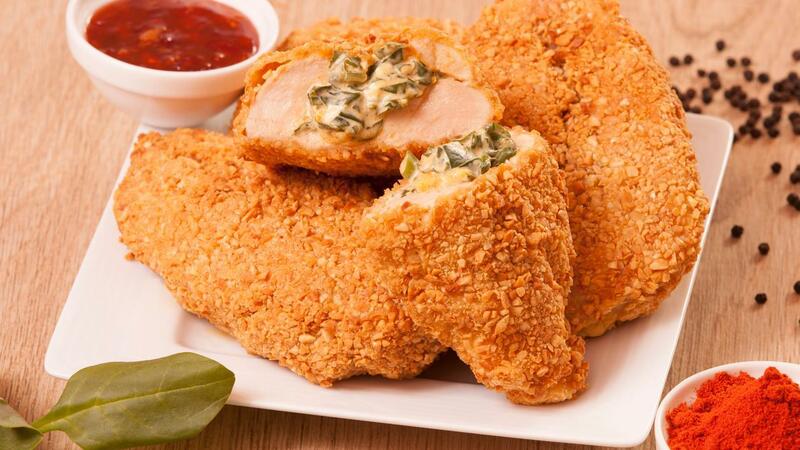 Take a heaping spoonful of the spinach & cheese mixture and pack it into the pocket; pinch the edges of the chicken closed. Repeat to crumb the remaining chicken. Heat the oil over medium-high heat; fry the chicken until the crust is golden, remove and drain. Serve with Knorr Thai Sweet Chilli Sauce.